The most critical step in building habitat for Monarch butterflies is to ensure a sufficient number of milkweed plants in the habitat. I would be hesitant to say the exact number of milkweed plants that would be required in a particular habitat as the sizes of habitats vary as well as the size of the milkweed plants within the habitat. Four or five milkweed planted in one area of the habitat will usually be adequate. Enough milkweed leaves must be there to support the Monarch population through its caterpillar stage which is devoted to voracious eating. Eric Carle, author of "The Very Hungry Caterpillar" based at least some of his famous children's book on fact: Caterpillars are hungry. In fact, they are eating machines. Tragedy strikes when there is not enough milkweed for the Monarch caterpillars. In late April of 2015, I wrote of a Monarch caterpillar catastrophe at the Garland Community Garden: Monarch caterpillars arrive at the Garland Community Garden. This story illustrates what happens when the supply of milkweed is not sufficient. The caterpillars strip all the leaves and thus, in addition to having no food left, have no protective cover to shield them from their many predators and thus they are easy picking. That's why we are recommending that folks have three or four milkweed plants in their habitat. One plant will almost never be enough. As many of you know, Mayor Doug Athas has taken the Mayor's Monarch Pledge. We had our first meeting with interested citizens a few days ago on February 23. One of the outcomes from this meeting has been the realization that we need to plant a lot of native milkweed here in Garland Texas. Frankly this is easier said than done and it will take some amount of diligence and dedication. Native milkweed seed is not that easy to find. Loving Garland Green has already implemented the beginning of what will be called "The Great Garland Milkweed Monitoring Project." This project was kicked off on February 15 when we held our first speakers meeting at the local Garland downtown library. 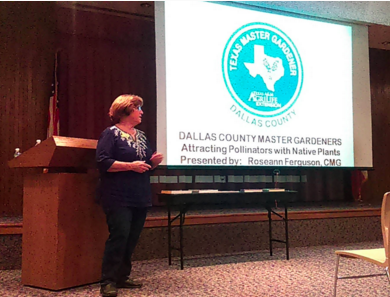 Our guest speaker was Roseann Ferguson, a local Garland gardener who is also a Master Gardener. Roseann spoke on the topic of attracting pollinators with native plants. Among our door prizes, we gave away a small flat of nine Asclepias asperula (or perhaps Asclepias viridis). Since the seeds for these plants were collected from a wild area in the late fall after the plants were gone, we can't make a definite determination until the plants mature. Goal: to give away 100 Native Milkweed seedlings on or before April 15 to 50 Garland residents (The seedlings will not be ready until the third or fourth week in March.) To be eligible to receive seedlings, participants must be Garland residents between the ages of 9 and 100. Yes, we trust children to be caretakers of plants. Report at least once a month via email with photos to Loving Garland Green regarding your milkweed, how its growing and what it is attracting. Following such a simple plan as this, we believe the growth of milkweed in our community as well as our community's interest in the importance of pollinators will be exponential explosion. Next year, for example, Loving Garland Green will have at least 100 seed pods, each having at least 20 seeds-- 2,000 native milkweed seeds. (These seeds sell today, when you can find them at 10 per packet for about $3.00.) No we likely won't sell them, but we will give them away and encourage folks to join the Great Garland Milkweed Monitoring Project.) Once again, in the spring of 2017 we will offer milkweed seedlings--only instead of 100 milkweed seedlings, we will be giving away 200 milkweed seedlings to 100 people. You can do the math from here and see what I mean in regard to exponential growth. But it's more than math, it's a community coming together to support a great cause: helping to strengthen the security of our food chain by providing habitat for pollinators--including the beautiful Monarch Butterfly. 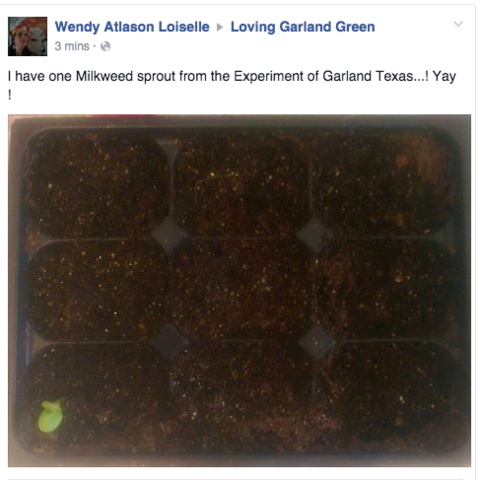 Loving Garland Green has already received its first milkweed report. Remember that door prize of a flat of nine planted native milkweed seeds we gave away on February 15? Well, just today I got the first milkweed report from the recipient of that gift, Wendy Atlason Loiselle of Garland, Texas. The little flat that we gave Wendy has 9 native milkweed seeds planted in it. These seeds were cold-stratified (in my fridge--not freezer for 30 days) and then soaked in Garland tap water for 24 hours prior to planting. They were planted on February 15 and the plant shown below showed up 11 days later on February 25. I'm sure there will be more to come. Germination rates vary. I've read that in the wild native milkweed germinate at the rate of only two seeds from each one hundred seeds. Germination rates from the native seeds that I have are much higher--so far closer to 50%. Thus I expect Wendy to end up with at least four milkweed plants. Perhaps before we can rescue Monarch, we need to give serious consideration as to how we can rescue native milkweed plants. In 2012, John Pleasants of the University of Iowa and Karen Oberhauser of the University of Minnesota estimated that 60 percent of milkweed has been eliminated from the grassland ecosystem. We are not talking about one species, we are talking here about the entire native flora being eliminated. All this is directly related to overuse of herbicides as an agricultural solution. The good news is that things are changing. Even the general public is becoming more aware of the destructive outcomes on beneficial plants than can result from indiscriminate overuse of herbicides on so-called weeds. Agricultural practices are also changing. For example, some farmers now leave wide borders around their fields where they allow nature to take her course with no herbicides. Government practices are also changing as well. State highway departments are cutting back on their use of herbicides along roadways. It will take time but at least it looks like we are moving in the right direction when it comes to cutting back on our overuse of herbicides. 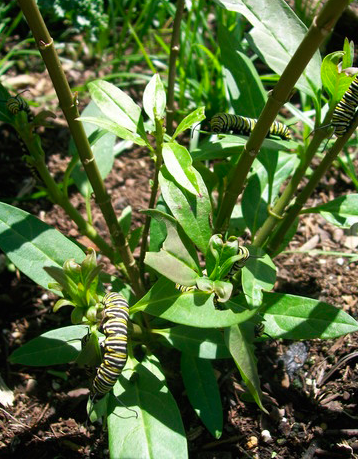 April 26, 2015 -- Five Monarch Caterpillars feeding on one Tropical Milkweed plant at the Garland Community Garden. These five caterpillars stripped the plant down to the stem in less than three hours. Because it was still early in the season, this plant had not even produced flowers yet. Unfortunately for the caterpillars there was no more milkweed and no more protective habitat cover. They were apparently picked off by predators as when I returned with a few potted milkweeds a few hours later, they were all gone. When it comes to establishing milkweed, the hardy tropical milkweed (Asclepias curassavica) I’ve found is very easy to establish and is widely sold in most nurseries whereas the varieties of native milkweed are difficult to find. This is likely due to the fibrous root system of tropical milkweed which readily lends itself to pot life where as the long taproot of the native milkweed does not and thus is not such a viable commercial entity for nurseries. [For those who may not know: Plants are characterized by one of three types of root systems: taproot, fibrous, or adventitious (roots that form on plant parts such as stems or rhizomes as ivy, iris and Horsetail (Equisetum arvense). ] The taproot of the native milkweed grows fast and long. However, one of the problems with tropical milkweed is that it does not die back in the winter south of the DFW area where there are no killing freezes. Thus some argue this encourages Monarchs to overwinter and not migrate to Mexico. Also in warmer areas such as south Texas and Florida, the leaves are prone to mildew which some studies indicate creates diseases among the Monarchs who come in contact with these plants—diseases they can pass on to subsequent generations. Plus, let's face it, the tropical milkweed is not native to Texas and thus we have no idea what impact it may have on our ecosystem here in North Texas but we can be fairly certain that the impact will not be great--and because of its prolific seeding capability, the tropical milkweed holds a good potential for developing into an invasive species. So all that taken into consideration: I plan to continue to have tropical milkweed in my garden at home as well as the Garland Community Garden--at least for the rest of 2016. First of all, I want to see how well the native milkweed we are planting does in terms of growing and providing habitat for Monarchs. I know first-hand that tropical milkweed has supported at least 16 Monarchs here in Garland in the fall of 2016. Without tropical milkweed, the world would be without at least 16 Monarch butterflies and many more as I have several friends I know who have captured and released monarchs here in Garland that fed on tropical milkweed. First of all, I'll monitor all tropical milkweed plants under my stewardship with extreme care. I will not allow any seed pods to mature. I'll pick them all off while they are still green. In the fall of 2016, if the planting of our native milkweed species are successful, I will dig up all tropical milkweed in my garden and the Garland Community Garden in the fall. I will keep five plants back in pots that I will bring in my home for the winter. These will be there in the event we find any late bloomer Monarch caterpillars in November or December as we did this year. Without those tropical milkweeds, our story of Happy 2016 the Monarch would not have had a happy ending. In the spring of 2017 I want to see how quickly the native milkweeds mature. Ideally they should be mature enough by the end of April to support Monarch caterpillars. If they are not, I'll continue to offer tropical milkweed with the aforementioned precautions. The goal here is to support the re-establishment of our Monarch population. 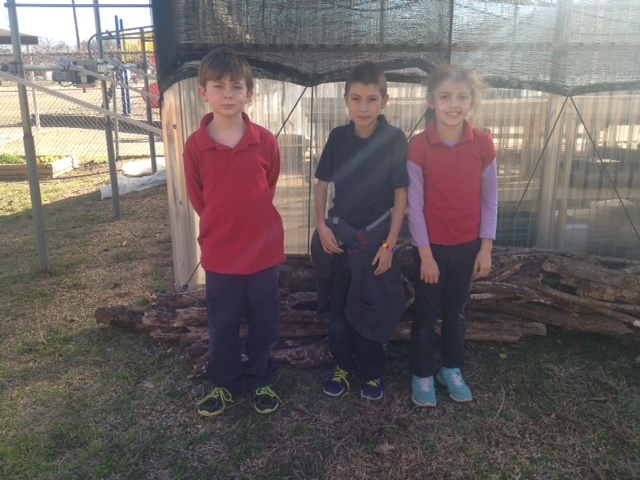 Moving Forward with Butterfly Habitats in Garland! This morning I decided it was time to transfer the six Asclepias asperula (antelope horn milkweed) seedlings from their inert seed potting mix into larger containers with garden soil. I'm glad that I did. Normally I would wait for the second set of leaves to develop. The taproots on these plants were already four inches long and the plants are not even a week old. I carefully used a square knife that is somewhat like a small spatula to carefully lift the seedlings from their seed flat. I put one seeding each into a 7 inch deep pot. From this pot they will go into the ground about the middle of March. 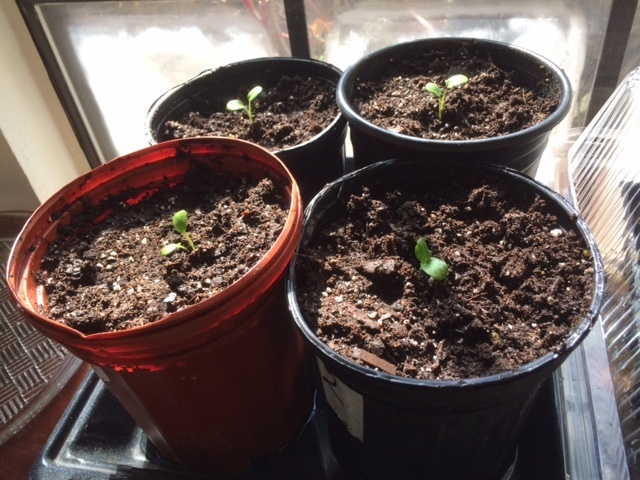 Four healthy Asclepias asperula seedlings--soaked in Garland city water and planted. Two Asclepias asperula seedlings soaked in sterile water prior to planting. We still have two seedlings that emerged a little later from the group soaked in Garland tap water prior to planting. Thus at this point, out of 18 seeds so far we have 8 seeds that have germinated. THE HUGELKULTUR/STRAW BALE BUTTERFLY GARDEN AT WATSON TECHNOLOGY CENTER BEGINS! Today Charlie and I delivered our first load of rotten logs to the Watson Technology Center. 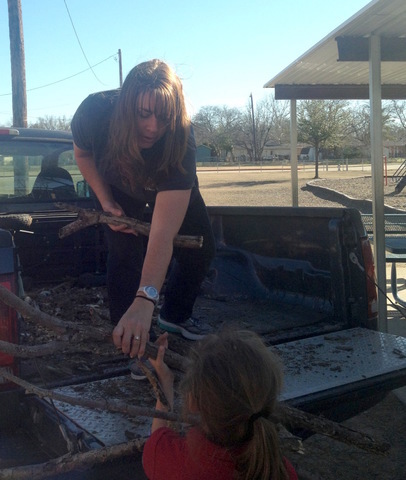 We met Jennifer Clements, a second-grade teacher at Watson along with three Watson students who helped Charlie and I unload the rotten wood into the area where the school greenhouse is located. This wood will eventually be used to construct a hugelkultur/straw bale butterfly garden. It will be the first such garden of this style in Garland, if not the world. It is an experiment that combines two types of water efficient garden beds: the hugelkultur and the straw bale garden. Assisted by the students, we will dig a u-shaped trench. Into the trench will go the rotten logs. On top of the logs we will put brown organic matter such as dry leaves. On top of the brown organic matter we will put a layer of composted manure. On top of that more dry leaves. On top of the second layer of leaves we will add uncooked vegetable scraps that students have brought from home. Instead of the garbage disposal, they will bring this green waste to the garden. After each addition of material we will water thoroughly. Next we will mix some expanded shale with the soil that was removed to create the trench. Then we will cover the trench with this amended soil. On top of the soil we will place the straw bales. After about 12 days of watering and adding organic fertilizer to the straw bales to begin their decomposition, we will install the plants for the butterfly garden. Hugelkulturs are a type of garden bed that has been used in Germany for several hundred years. Its proponents say that these beds are extremely self-sufficient. Because of the water retention capacity of the logs and because of the decaying organic matter. These beds do not require additional feeding or watering (except in cases of extreme drought) beyond what Mother Nature provides for up to 20 years. 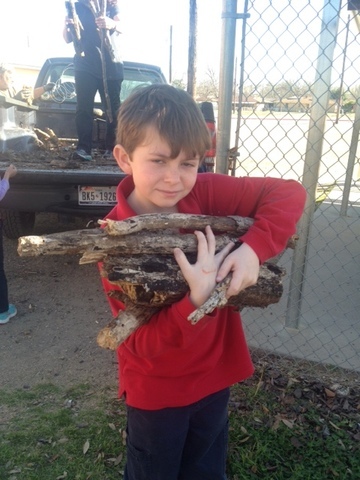 One of the Watson Technology students carries some rotten logs. Three Watson Technology Students pose in front of the pile of wood they so enthusiastically hauled to the garden. By the way, the Watson Technology students are already practiced gardeners. Thus we expect their butterfly garden will be a sight to behold. 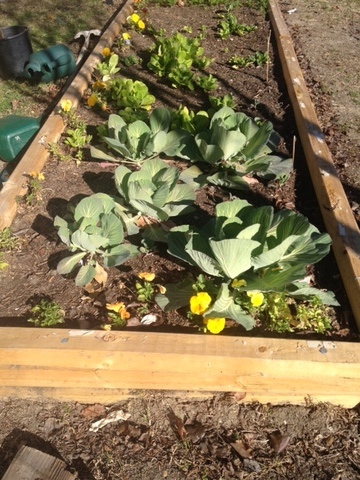 Below is a photo of one of their greens and pansy beds. Flowers and vegetables are a hard combination to beat. I'm happy to report that Loving Garland Green's first in a year-long series of speaker presentations on topics of urban agriculture was a great success last night. The speaker from the Dallas County Master Gardeners, Roseann Ferguson, was excellent and her presentation was very informative. Roseann is also a resident of Garland and a former school teacher in the Garland ISD. We saw slides of Texas native plants--some of which I had neither heard of nor seen before. For example, Roseann told us of Zexmenia (Wedelia texana) a lovely flowering perennial that blooms all summer long and is a host plant for the black swallowtail butterfly. I'm going to try to find some of these plants as Roseann promised they will grow under practically any condition. And then there is Prairie Parsley (Polytaenia nuttallii) another Texas native plant I never heard of. This one too is a host plant for the black swallowtail butterfly. Roseann even brought plants for everyone. This, another native I never heard of, is Bird Pepper and also known as Chilipequin (Capsicum annuum glabriusculum)--a plant that is also a butterfly host plant (not for Monarchs) but for other local butterflies. 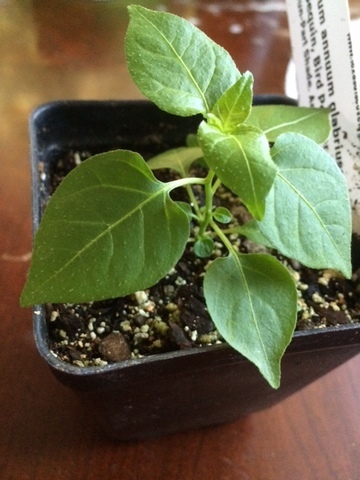 This plant is the official native pepper plant of Texas. I will be planting mine down at the Garland Community Garden. The plants were a donation from the Texas Discovery Gardens in Dallas. Roseann was not alone in bearing gifts related to native plants and urban agriculture. Loving Garland Green presented Roseanne with a flat of six Asclepias asperula (antelope horn) milkweeds to be. 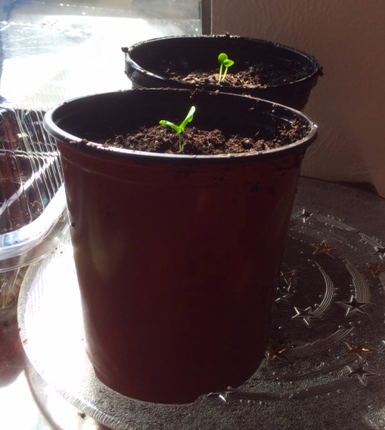 The seeds in this flat had been soaked 24 hours in Garland tap water* and planted yesterday on February 15. If they turn our the way other seeds from this same source did, Roseanne should have six Asclepias asperula milkweed plants on or before March 1. I'm also happy to report that Loving Garland Green was able to present Roseanne with an honorarium of $40 to be donated to the Master Gardeners of Dallas Texas. Loving Garland Green also gave away a flat of nine planted Asclepias asperula seeds to one of our lucky guests whose name was drawn. In addition, three other lucky guests each received a packet of 10 Asclepias asperula milkweed seeds. Nancy Seaberg was the recipient of the drawing for a large hugelkultur pot filled with rotten wood, leaves, and composted manure. We also took the opportunity at this meeting to pass along information regarding the Mayors' Monarch Pledge. Our own Garland Mayor, Douglas Athas, has taken this pledge as have many leaders of municipalities in Dallas and Tarrant Counties. Ask if your mayor has taken this important step. With a little bit of luck, in about two weeks Roseann's Milkweed will look like the ones in the back container as shown in the photo below. Those Asclepias asperula were soaked in Garland tap water 24 hours prior to planting two weeks ago. The two in the container in the foreground were soaked in sterile water. Come Learn about Pollinators and Native Plants! BE EARLY AND GET A GOOD SEAT! I'm very excited. This will be our first in a series of presentations by guest speakers on various aspects of urban agriculture. We are starting out with a presentation from the Master Gardeners of Dallas County on the topic of pollinators and native plants. There will be door prizes of native plants which our Master Gardeners speaker is bringing and also two door prizes from Loving Garland Green: a flat of six Asclepias asperula seeds which have been prepared and planted in organic seed starting mix and also a hugelkultur pot that I've prepared for a lucky winner. This large pot (recycled plastic pot from a large tree) will have most of the ingredients for making a hugelkultur pot: rotten logs, leaves, manure, and brown organic matter. All you will need to add are some lettuce or other fresh vegetables from your veggie bin that are past their shelf life, water, and some garden soil. These pots are based on the same theories that support hugelkultur beds that have been used in Germany for hundreds of years. They are designed to emulate what happens on the forest floor when trees fall and rot--thus holding water and providing nourishment as they decay. You will need to water the plant you put in these pots, but not nearly as often as you would a typical potted plant. You will not need to feed the plants for at least two years. Asclepias viridis or Asclepias asperula? --Regardless, this is testimony to the water of Garland. 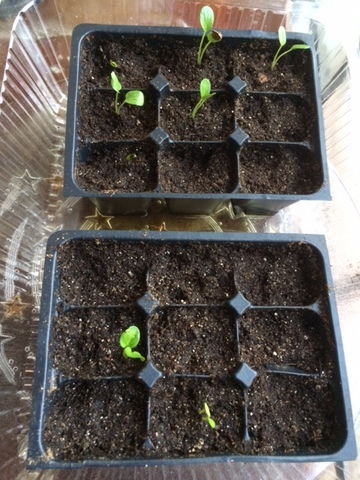 After 12 days from being planted, four milkweed seeds that were soaked in Garland tap water 24 hours prior to planting have germinated (shown in the container on the right). 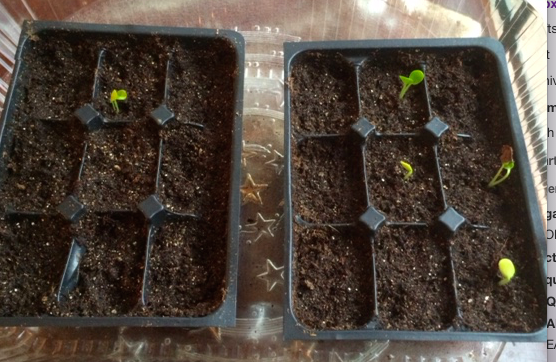 Only one seed soaked 24 hours prior to planting in sterile water has germinated (shown in container on the left. In the wild, according to some geologist, only 2 seeds out of 100 milkweed seeds will germinate. Thus far, I have five seeds out of 18 that have germinated in a protected environment. Actually, someone should have told Juliet that names are important identifiers--especially when we are referring to names of plants. These seeds, which a friend rescued for me from the White Rock Lake area are unknown as to which type of antelopehorn they are. The seeds got their name from the shape of their pods which resemble antelope horns. 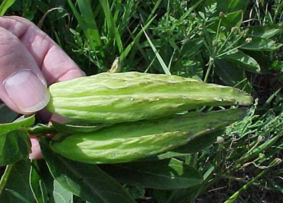 Since we do have a few pods, or parts of pods, we can make some fairly good guesses as to the species of milkweed. As many of you know, way back when Carolus Linnaeus developed a Latin binomial nomeclature for plants which is referred today as the "scientific name" for a plant. It consists of the Genus and the Species. 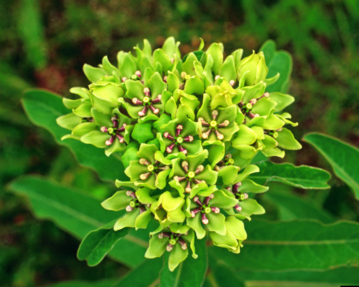 The Genus name for milkweed is Asclepias. 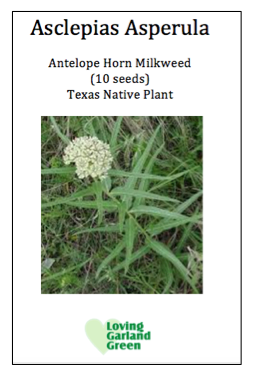 Here in Texas we have over 30 varieties of native milkweed or Asclepias. 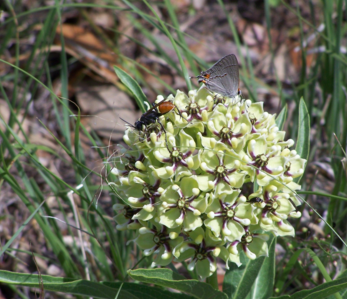 You can find a complete list at Texas Milkweeds. Another advantage for using Latin names for plants is the consistency. Regardless what a plant may be called in one state, region or even country--when one uses a Latin name as the identifier, the name is always the same, regardless the language. It makes for a common language to facilitate scientific study. 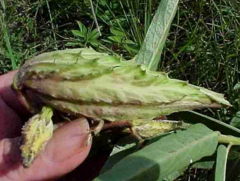 The photo above shows the seed pod for the Asclepias viridis. I'm inclined to believe the native milkweed plants I have are Asclepias asperula as the pods from which they came were shorter and fatter as opposed to the elongated pod of the Asclepias viridis. The flowers of the two plants are quite similar in shape and cluster formations. The main difference I see is that the Asclepias asperula is a much lighter green. The pods of the Asclepias asperula appear to be rougher and not as elongated as those of the Asclepias viridis. No, I'm not talking about the plans for planting milkweed on 100 miles on either side of Interstate 35 from Texas to Minnesota. But if you haven't heard about that plan, you can read more details about it in this article from the Minneapolis Star and Tribune. A 2012 study by Oberhauser and John Pleasants, a scientist at Iowa State University, showed that half the milkweed in the corn belt disappeared between 1999 and 2010. Milkweed is critical to the Monarch because the milkweed is the only plant on which the Monarch will deposit its eggs and it is the only plant on which the Monarch Larvae feed. Unfortunately for us and the Monarchs, bringing the milkweed back will be a lot harder than it was to destroy it. In order to raise the milkweed population to 255 million in five years, one geological specialist has estimated it will take 500 million milkweed seeds--and we don't have 500 million milkweed seeds. Even it we did, according to this specialist, only one out of one-hundred seeds germinates. It's the ordinary citizens who will make the difference! Find some milkweed seeds and start growing them yourself! When experts like that geological specialist tell us that only one seed from a hundred germinates, the part they leave out is that only one seed from a hundred germinates under natural conditions. However, this is not true when the seeds are carefully tended and no, I don't mean with latex gloves and sterile water. I read some literature recently on how to propagate milkweed seed. Oh my word! The "expert" insisted one had to wear latex gloves, use sterile water etc. in order to successfully germinate seeds. Being a part-time contrarian, I decided to put the "expert" to test. First of all I did not cold-stratify the seeds in my refrigerator for 40 days or even one day. Second of all, I handled the seeds with my bare fingers. And finally, I decided in one of the two (nine, three-inch deep flat containers to use tap water instead of sterile water. I did soak the seeds overnight: one group of nine seeds in tap water and the other group of nine seeds in sterile water. This morning, 13 days later, I saw the first of my results: Two green antelope horn milkweed have sprouted from the flat with the seeds I soaked in tap water. Already I've beaten the odds set by the expert. 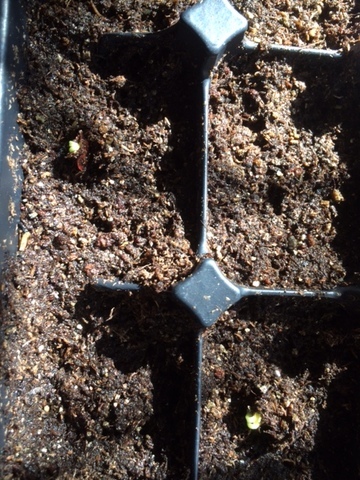 Thus far I have two seed sprouted from 18 that I planted. I fully expect more. I'll keep you posted. In the meantime, here is a great event upcoming for you on Monday February 15 in Garland Texas. Mark Monday February 15 - 6:30 to 7:30 PM on Your Calendar! You are invited to attend a special event at the Garland downtown Nicholson Library at 625 Austin Street. A Master Gardener will present Attracting Native Pollinators with Native Plants. The presentation begins promptly at 6:30 PM and there will be door prizes of native plants. What can you do to help the Monarch? Ask Mayor Athas of Garland Texas.